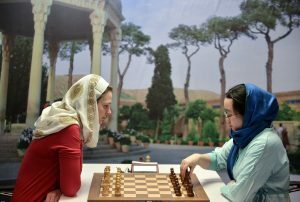 Anna Muzychuk (left) of Ukraine plays against Tan Zhongyi (right) of China during the final day of the Women’s World Chess Championship 2017 on March 3 at Espinas Palace Hotel in Tehran, Iran. Zhongyi defeated Muzychuk of Ukraine to win the championship. Left: Photo by Fatemeh Bahrami/Anadolu Agency/Getty Images.